The ColorQube 8700 Multifunction Printer continues our tradition of innovation as the first desktop Solid Ink device completely engineered to deliver true multifunction performance. You get environmentally preferable features, unbeatable ease of use, consistently exceptional image quality and affordable color printing. Always superior output. Solid Ink gives your documents rich, vibrant colors on a wide range of media, including recycled paper. The colors you expect. PANTONE calibrated solid-color simulations and Xerox color correction technology deliver results that always match your expectations. Incredible detail and halftones. 2400 FinePoint print resolution ensures exceptional print quality. Long-term consistency. Every ColorQube 8700 produces the same, consistent color, page after page, year after productive year. Intuitive color modification. The Color By Words feature lets you select desired color modifications from a simple drop-down list. Reduce your impact. Cartridge-free Solid Ink sticks come with minimal packaging, and generate up to 90% less printing waste. Over the product’s lifecycle, less energy is required than comparable laser MFPs*. EarthSmart print driver settings. Easy-to-use print-driver gauge allows you to choose the most environmentally conscious print settings. Minimize energy usage. Intelligent Ready technology learns your workgroup’s usage patterns and moves to low-power mode during downtime. Save shipping costs and storage space. Compared to toner, Solid Ink’s smaller packaging costs less to ship and fits in a desk drawer. Fast results. Get your jobs out as fast as 44 ppm color and blackand- white, with a first-page-out time as fast as 8.5 seconds for color documents. Plus, two-sided printing comes standard - and saves paper. Total convenience. Save money and precious office space when you combine printing, copying, scanning, emailing and faxing, plus a standard convenience stapler, into one powerful desktop device. Complete control at your fingertips. The state-of-the-art 7-inch color touch-screen interface features bright icons, intuitive menus, and embedded help videos for easy, step-by-step troubleshooting assistance. Full range of scanning solutions. Simply scan your hard copy documents and get searchable digital files** that can be automatically shared via email, Internet fax or network folder, or stored on the device or any USB memory device for true portability. And it all comes standard. Extend your possibilities. Xerox Workflow Solutions, built on the Xerox EIP platform, enable productivity-enhancing solutions via the color touch screen interface. Learn more about our many solutions offerings by visiting www.xerox.com/software-solutions. Easy expandability. Experience longer print runs and convenient finishing with the 8700XF configuration. 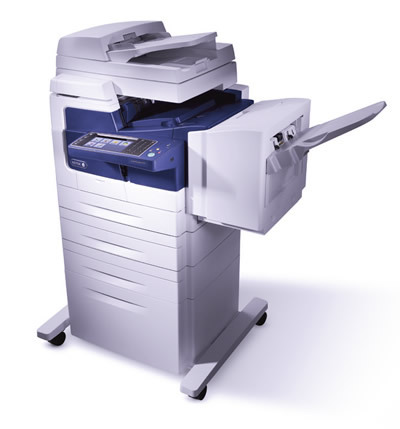 You get expanded paper capacity of 3,475 sheets of letter, A4 or legal-sized media, plus a 650-sheet finisher with up to 50-sheet stapling and offset stacking. Always secure. The ColorQube 8700 safeguards your sensitive data with 256-bit encryption using the FIPS 140-2 standard, plus built-in support for IPv6, IPsec, secure HTTPS, and other industry-standard network security features. * Based on 7,500 pages per month for 4 years. ** 8700X and XF configurations only. Maximum Page Size Up to 8.5" x 14"
Duplex Automatic Document Feeder: 5.8" x 8.3" to 8.5" x 14"
Main tray: 5.8" x 8.3" to 8.5" x 14"
Optional trays: 5.8" x 8.3" to 8.5" x 14"
High-Capacity Feeder: 8.5" x 11" or 8.5" x 14"
Multi-Purpose tray: 3" x 5" to 8.5" x 14"